This year marks the 400thanniversary of the birth of a remarkable tradition of specialist ceramic art in Japan. Porcelain production began centuries earlier in Korea and China, but the transfer of skills from these two regions to the ceramic artisans of Arita, on the southern island of Kyushu, soon lead to a flourishing development in Japan. By the 1640s porcelain wares from Arita were being exported to Southeast Asia, and later in that century they began to reach as far afield as Europe by means of trade through the Dutch East India Company (Verenigde Oost-indische Compagnie, or VOC). The porcelain produced in Arita was called ‘Hizen’ or ‘Imari’ ware (伊万里焼) because it was largely shipped from the port of Imari in the former Hizen Province of northwest Kyushu. Dresser was travelling in Japan at the time of the ‘Satsuma Rebellion’ and so never visited Arita himself, a fact which might perhaps have also coloured his view. Dresser was treated as an honoured guest by the Emperor and toured extensively throughout central Honshu. He was a leading figure in the Aesthetic Movement, and as such his work had a profound influence back in England where the ‘Anglo-Japanese style’ affected modern trends in the decorative arts and architecture during the last half of the 19th century. Dresser's dismissal notwithstanding, Arita itself remains to this day a celebrated and vibrant producer of highly sought-after and much coveted porcelain and other ceramic wares. In the Spring of 2004, whilst I was working at the Fukuoka Bijutsukan, I spent a gloriously sunny day, with the famous cherry blossoms in full bloom, exploring Arita with a curator friend who specialises in Japanese ceramics. Because of this connection I was lucky enough to see behind the scenes and learn firsthand how Arita wares are created. We visited two kilns, both of which had been established 400 years ago with the distinctive skills of ceramic production at each being handed down through the generations, from father to son. Arita lends itself both geologically and topographically to the production of porcelain. Porcelain stone was first discovered here around 1610, it is also a region of densely wooded, sloping mountains with fast flowing streams, thus providing the perfect combination of resources – porcelain stone as raw material, water for processing those materials, abundant wood for fuel supply, and the natural inclines needed to build the linked-chamber, climbing-style of kilns (noborigama 登り窯) required for creating and firing such ceramics. The first kiln we visited was that of Imaizumi Imaemon XIII (1926-2001). 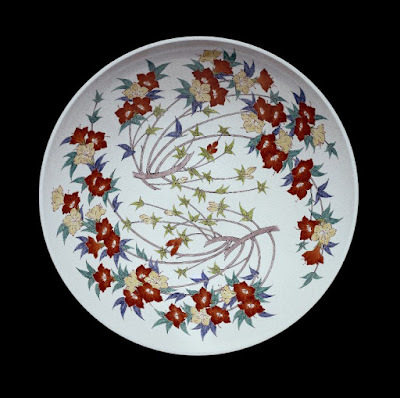 Imaizumi learnt the porcelain with overglaze enamel technique in the Nabeshima style from his fater, Imaizumi Imaemon XII (1897-1975). This technique, known as iro-e jiki (色絵陶器) refers to the application of polychrome enamels to the surface of a ceramic vessel at different stages in its firing process. Colours such as red, yellow and green are painted with a brush onto an already glazed and fired surface which is then fired again at a lower temperature. The temperature of the re-firing is dependent on the chemical composition of the enamel colour, hence polychrome wares can be re-fired several times before they are finished. Such techniques are likely to have come to Japan from China. It was fascinating to see the care with which these enamels are painted onto the ceramics by hand, and how the colours applied transform from dull grey-green hues into bright reds and vivid greens or luminous blues after firing. Seeing inside the enormous kilns was fascinating too. Arita kilns are built utilising the steep incline of the surrounding hills which helps to regulate different temperatures as required at various points in the long stretch of the kiln. Imaizumi Imaemon XIII was designated a ‘Living National Treasure’ in 1989, and, at the time I visited, had only recently been succeeded by his son, Imaizumi Imaemon XIV (born 1963), who is continuing the Imaemon tradition. Since the post-war recovery period of the 1950s Japan has had a system in place for recognizing certain artists and crafts-persons as ‘holders’ (hojisha 保持者) of ‘important intangible cultural property’ (jūyō mukei bunkazai 重要無形文化財). In this sense the Japanese Government seeks to support a particular craft skill, such as those found in making ceramics, textiles, lacquer, metalwork (with the exception of swordsmiths), or wood and bamboo crafts, by recognising the artist as its officially designated holder. Perhaps naturally enough, over time this concept has more popularly become associated with the individual artist rather than their particular art per se – and, as such, they are now more commonly referred to as ‘Living National Treasures’ (ningen kokuhō 人間国宝). These individuals are held in high esteem throughout Japan and much cherished in their local areas. By the time they are chosen they are often already in their fifties or sixties or older. They receive a modest stipend from the government in order to maintain their traditions and to help them pass on their skills to the subsequent generation. Yet such traditions in Japan are far from preserved in aspic. Just as the ‘Living National Treasures’ are individual people who grow and age with time so too do the crafts and techniques which they nurture during their tenure of that designation. That sense of tradition (dentō 伝統) in Japan is very much characterised by what Japan’s most famous poet, Matsuo Basho (1644-1694), described as a process of ‘constancy and change’ (fueki ryūkō 不易流行). Change is the dynamic by which tradition is kept vibrant, and constancy (or continuity) is the means by which that renewal is harmonised and made most natural. Transition occurs organically through transmission, the old continually becomes something new without jarring with what has gone before. Gagyu Gama (臥牛窯 or Gagyu Kiln) was the second kiln I visited. Yokoishi Gagyu is similarly designated an ‘Intangible Cultural Asset’ or a ‘Living Cultural Treasure’, a title bestowed by the Nagasaki Prefectural Government in 1975. He is the thirteenth master of the Gagyu kiln, which was also founded around 400 years ago. The curious name, “Gagyu,” is said to have been derived from a visual aspect of the kiln – which the feudal lord of the Hirado clan, Chinshin (Shigenobu) Matsuura, thought looked like an ox lying down on the ground (the literal meaning of the term, 臥牛 gagyu), and so the name stuck! … The Gagyu workshop practises the ‘hakeme’ (刷毛目) technique, using a red clay rich in iron which once thrown is then overlaid with thick coatings of a white slip laid by ‘hake’ (刷毛) or wide flat brushes to create a unique variety of striations. The Gagyu kiln is now the only kiln in Japan to produce ‘Utsutsugawa-Yaki’ (現川焼) wares with the hakeme technique. And Gagyu Sensei himself was a warm and welcoming host with large hands which he took pride in showing me were remarkably softened and smoothed by years of working with the soft clay – a real genuine labour of love, as he described it. In Japan such arts and crafts are deeply cherished. A visit to any city or large town in Japan will invariably find a number of exhibitions being held devoted to one or more of these areas. Likewise, it’s possible to buy these arts and crafts works in many different outlets – I’ve seen Gagyu Sensei’s works on sale in the big department stores in Tokyo, and Imaizumi Imaemon XIV’s works can be found in a number of very prestigious museums worldwide (including the V&A and the British Museum). Television programmes, newspapers and magazines regularly focus upon the works of such ‘Living National Treasures.’ There have been strong connections with the arts and crafts movements of the West too, notably Bernard Leach’s collaborations with Yanagi Muneyoshi and Hamada Shōji in the ‘Mingei’ (Folk Crafts) movement in the early 20th century, yet the arts and crafts movements are perhaps cherished and nurtured in Japan to an extent and in a manner which is unlike anywhere else in the world. It’s truly a vital part of the Japanese way of life and their outlook on the world and our place within it – it’s both an awareness and an appreciation. Pervading all things and everything we do is that fluid yet timeless essence of continuity and change. My Imaemon Iro Nabeshima dish is: 16.9 cm diameter, 2.8 cms depth. My Gagyu sakeflask and cups are: 10.7 cms height; 6.1 cms max. diameter (flask); 4 cms height, 5.5 cms max. diameter (each cup, x2); single Gagyu sake cup with blue floral design: 5.1 cm height, 5.1 cm max diameter. An exhibition at the British Museum (Room 3, Asahi Shimbun Displays) titled Made in Japan: 400 Years of Kakiemon Porcelain from June 23rd to August 31st 2016 examines the work of another ‘Living National Treasure’ from Arita working in the Iro-e technique.